Time melts away while watching Damien Chazelle’s latest, La La Land about the nature of being an artist, dating a fellow performer and how dreams and expectations are hard won and that perspective too is a difficultly earned gift in growing older. How greatly do we yearn for the blessing of foresight when we enter a relationship? We, so swept away by the love spells cast under moonlight, can’t help but fall earnestly for earnest filmmaking. Chazelle has created one for the ages, one that lingers and doesn’t so much grip its claws into your heart as it saunters up to it and seduces it in. La La Land proves that cynicism is an unnecessary factor in the role of filmmaker and that he can in fact have his cake and eat it too. 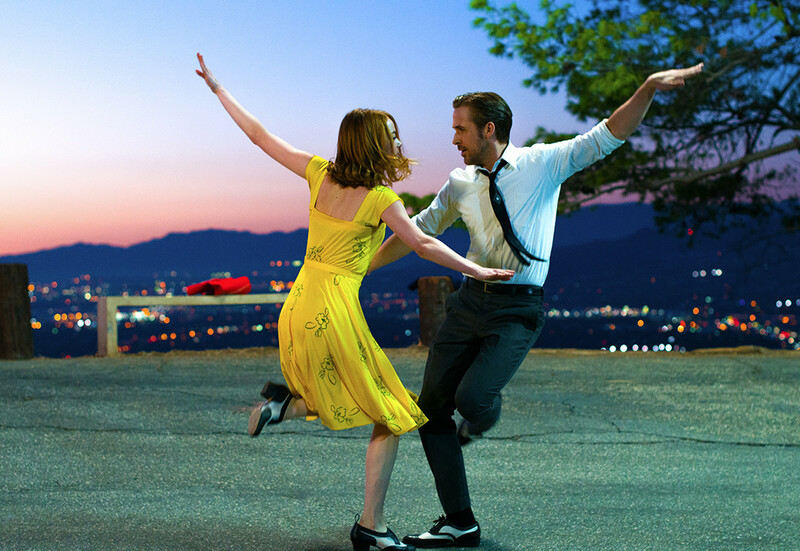 Both a call back to the musical of old while unabashedly modernizing the picture, La La Land manages to be timeless without having to ever compromise a thing. Unexpectedly bittersweet but towering in its ability to inspire a joyous viewing experience, La La Land has us with our eyes glued, feet tapping and hearts pounding with anticipation of just what wonder it’s going to produce next. Sebastian (Ryan Gosling) is a jazz enthusiast and piano player who hopes to one day open up his own jazz club that honors the origin of the craft. Mia (Emma Stone-magnetic) is a wannabe actress who’s ranked up a number of auditions, but never seems to get that call back. Their lives intertwine after a few chance meetings and they fall into an all encompassing love story, in a film that is adamant about presenting an earnest perspective at the notion of chasing your dreams as it is the life altering effects of a genuine romance. As the two, and their relationship, progress they find it increasingly difficult to find time simply together, prompting the question about the longevity of a romance in show business. Chazelle’s absolute lack of cynicism in his screenplay presents a musical that both is unflinchingly modern and comical but has the sweet tinges of the past, both an homage to the musicals of old while simultaneously paving its own mark in the 21st Century. Greater than his breakout Whiplash, Chazelle goes big on ideas in his latest effort with a deeper twinge of melancholy than many may expect from trailers alone, some stunningly captured choreography and first and last scenes that are showstoppers for wildly different reasons. From the swirl of the camera in Mia and Sebastian’s first dance, to their gravity free dance across the clouds to the blues of their apartment as they croon a duet, Chazelle makes the most of his settings, fully committing to creating as grand an experience as possible. If there is a moment that might leave something to be desired it happens in a small subplot involving John Legend that works more as place setting for later narrative developments than a piece of the story itself. Regardless, the goodwill built up until this point in the film means that the confidence we have in the film survives the slight dip. The film wouldn’t work without the hazy and vibrant atmosphere it builds with it’s cinematography and few films have looked this good as it embraces yellows, purples and blues. Stones blue orbs and yellow dress are captured with whimsy, as is the twinkling lights of L.A. both on ground level and above, as Mia and Sebastian go about their lives. Linus Sandgren has a keen eye for lush, romantic settings as each frame of Mia and Sebastian’s courtship places us directly in their head space as we too fall for these love birds. But it’s the way that all of these elements come together that create such a memorable picture. Sandgrens photography, Chazelle’s dexterity, Stones vulnerability and Gosling’s charisma, to the original music composed by Justin Hurwitz, every element brings its own charm and own sense of life to a picture that is full of it. The film wouldn’t have worked without the dance numbers or the lived in and sometimes volatile chemistry between Stone and Gosling; La La Land is a film where every element clicked into place. It’s filmmaking at its brightest. There is something so profoundly moving about La La Land that takes its time is alerting us to it’s presence, this notion of hope and following ones dreams that isn’t lackadaisical and met with the expected learning curve that dreams aren’t for everyone. It’s the most optimistic visage of the “follow your dreams” mantle I’ve seen on film in a long while. The world of La La Land is both one we can recognize and also one we desperately yearn to join, in all it’s musical and tap dancing wonder, where loss and triumph don’t go hand in hand but are separate elements of life. La La Land doesn’t sweep us off our feet as if we too were weightless just because it presents a life full of success and music but because we can watch and see the passion put forth by Mia and Sebastian. As Mia tells Sebastian regarding jazz, we love it because they love it, it being jazz music, classic films or one another. Rather than go the route of other gaudy Hollywood pictures that love to build itself up, La La Land celebrates the artist, rather than the machine that spits them out. Chazelle and co. have created a magical moment in time over the span of it’s two hours. Perhaps upon second or third viewings the sparkle will have been dusted off, or the heartache at having to sacrifice parts of ourselves for our goals or real “adult lives” won’t connect as greatly, but for now, La La Land is one of the best experiences offered to us in film, where we loose ourselves to these characters, their plights and more than anything, their dreams, as we too wish we could be lifted above and dance among the clouds, lost is our own worlds of music, storytelling and love. This is a reprint from the 2016 Toronto Film Festival. For more TIFF 2016 coverage, go here.